A couple of years ago I started to do a sideless surcoat. 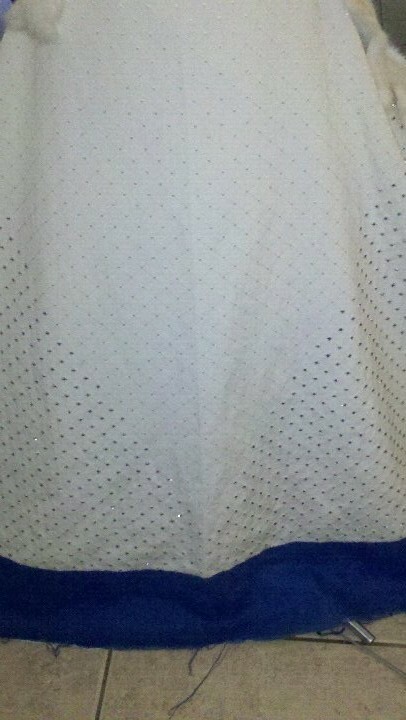 I used fabric that was in my stash and started beading.. 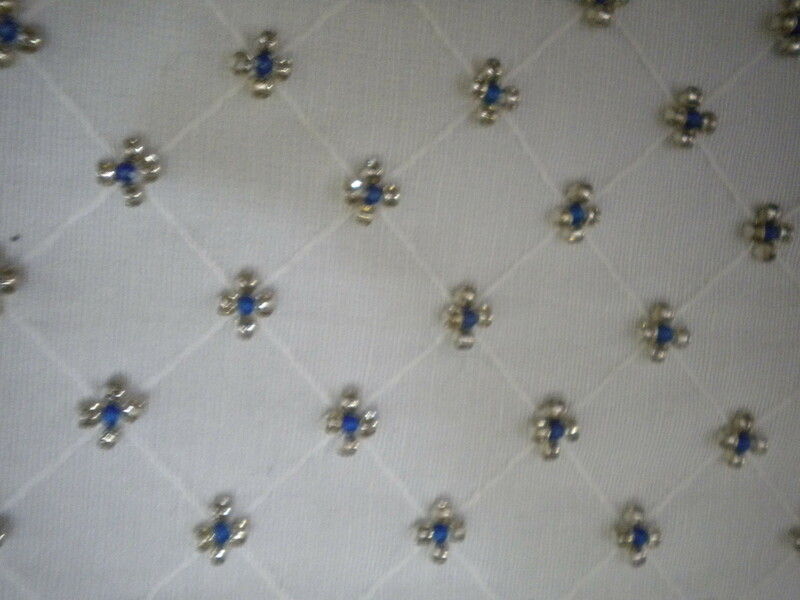 The fabric was white with a diamond pattern that was perfect to embellish. Being from the Kingdom of Trimaris blue and silver beads would be perfect. It never occurred to me that this would turn into a year long project. The pieces traveled with me everywhere, even at the airport where an audience gathered and asked questions. It was amazing that one of the question/statements from an older lady was “Women in America still hand sew?”. This is a full front view. 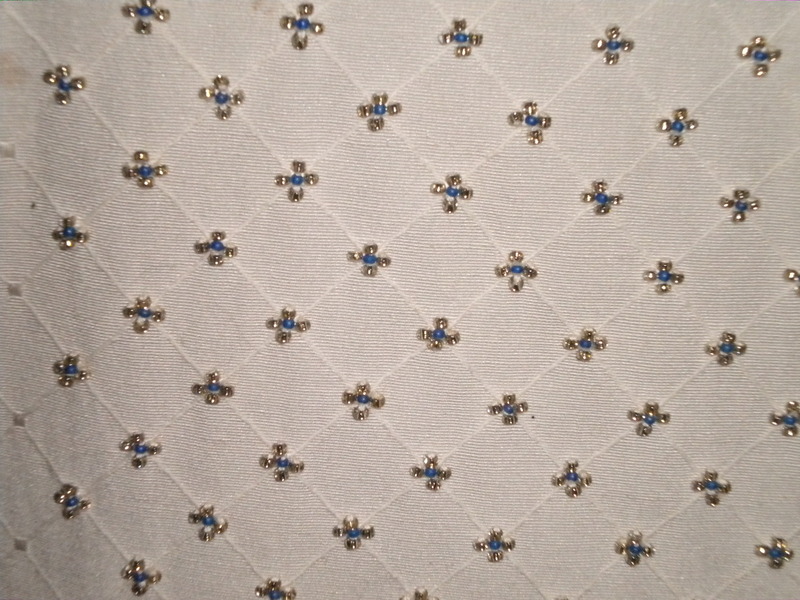 The beads are from neck to floor and the fur is a 2″ width pinned on. 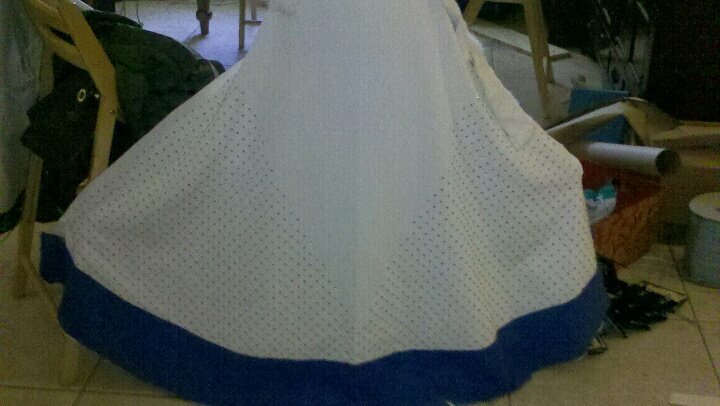 The over dress is lined in cotton and the bottom band is of linen (blue to carry on the Theme of Trimaris colors). This post has been inspired because this dress was recently pulled out of the closet and worn with the blue cotehardie under-dress.. “wow” I really need to finish this off correctly. As I took out the rings lacing on the cotehardie (pics to follow) i was amazed how much I have learned and how many mistakes I made. As the tedious job of taking apart all the hand stitches thoughts of how could I have entered this in GW open competition as a work in progress…. Though the comments were encouraging and getting both yellow and white bead made me happy now that I have moved forward it is obvious how much growing has occurred in two years. 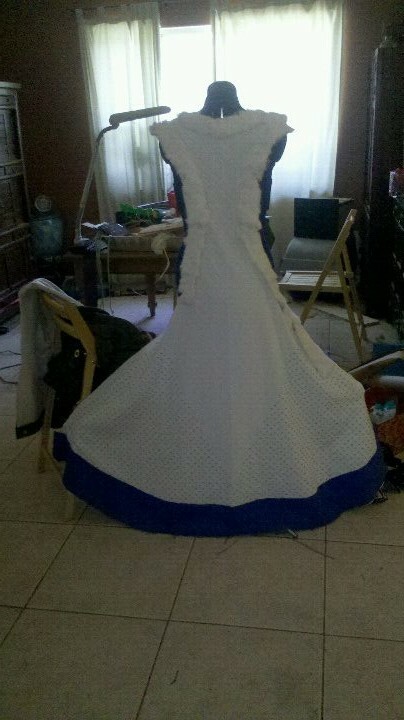 Now comes the “refurbishment” of this ensemble.. The Triskels need to be added to the blue band, eyelets need to be handsewn down the back of the cotehardie, and the fur needs to be applied differently. So with fur flying and seam ripper in action lets see what happens…. Beautiful! With fur, real or fake, sew bias tape to the edge. Don’t sew directly on the garment. This way it is easier to put on and take off when washing. Especially white fur.